Michael Mina bringing RN74 to Seattle? That’s what I hear. For many months, if not a year, I’ve been hearing rumors that San Francisco-based super-chef Michael Mina — with nearly 20 restaurants coast to coast — is bringing his brand to town. And then I got my hands on very good information that looked like proof-positive. The word was that Mina and his team would be recreating their new wine-soaked San Francisco restaurant RN74 in downtown Seattle. So, truth or rumor? 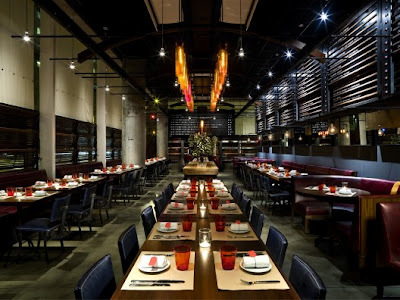 “We are absolutely considering opening a restaurant in Seattle, and RN74 is the restaurant being considered,” says Kristin Koca McLarty, V.P. of public relations for the Mina Group. Despite the “It’s a fact, Jack!” info I was privy to, McLarty insists that “considering” does not mean “done deal.” And yes, she says, it’s a downtown spot they’ve got their eye on. I look forward to hearing — and sharing — further details if (and when) that deal’s finalized. RN74 — a San Francisco treat — coming here? We’ll see.